Jays' Tee Vee: Just Shaddup Already! appear with this articles' original posting on Aardvarks' Plumbline blog. It has been observed that the Dread Dormomoo * and I have never had a trivial conversation. This is an offshoot of one of our palavers. Social networks like Facebook and Twitter provide anyone with a household logic the means to Make A Statement, to Let It Be Known. It's like a blog without commitment, only obsession (One more scroll, and I'll go to bed....). The Need to Say leads ineluctably to the Need To Have Summat To Say., thus many will speak their mind (or what passes for it) on any topic at hand; the Outrage du Jour, because everyone deserves my opinion, and I'll bust like Alderaan if I don't state it. This makes for endless bloviation, a verbal spittle sprayed on the front rows. The outrage du jour, then, is the trendy fixation of the moment, driven by talk radio, Drudge, the front page, whatever is whipping up froth about whatever topic is George, is the thing right now; social media driven by media, which sees what is trending in social media and reports it, a hamster-wheel of inconsequentiae. And people read, and hear, and rage, and talk, because that is what we are good at, and it makes us feel like we have Done Something by our self expression, when all we have done is express our opinion, an opinion that no-one really needed. Christians, bless our hearts, are the chiefest of sinners, at least the (politically) active ones. An Issue is put forth, support for some dire practise, or an opinion by a left-leaning person, or a right-leaning one, or an upstanding middle-of-the-road one. Well, I have to respond! I must fix it! I must state my opinion! I MUST SUCCEED! For the last forty years, the churches have been led by the nose to do what they have not been assigned to do, to be what scripturally they patently are not! Between the Falwell and Robertson followers, trying to vote in the Kingdom of God, backing God's Own Party, and the vocal-oids of today who MUST weigh in on any issue, whether it impacts the church directly or not, we politically savvy (maybe) believers have managed to inoculate the culture-at-large against the Faith Once Delivered. I have a son who is characterised by the fact that he always stops speaking one sentence too late. Our society has nurtured the same for itself, and that (especially) means Christians. The recent Phil Robertson unpleasantness is somewhat of an example, though he was answering direct questions in an interview (a disadvantage conservative Christians have, usually being taught to answer questions as asked, a little thing called honesty and candor). I see time after time Christian politicos, professionals, and just plain folks being goaded into making...unwise...statements and professions on the public stage, the effect of which is to swerve the conversation away from the (often cogent) point being made to one that is sure to cause embarrassment and facepalming on a grand scale. Just because it is in your mind, does not mean it must come out of your mouth. Just because it is a tenet of your beliefs, or a closely-held opinion based upon your beliefs, you are not called upon to blurt it to the world. The Gospel is what we as Christians are to teach to the world, not derivative opinions. Neither Jesus nor Paul waggled the finger of Condemnation at the sinners, the hoi-polloi. (At self-righteous religious types, on the other hand....) They warned people against sin, certainly, but did not condemn. Paul, seeing all of the idols in Athens, did not take opportunity on Areopagus to condemn all of Athens to perdition, but rather used it as an opportunity to identify their "unknown god" as being the Messiah Jesus (even quoting one of their own poets). Therefore, we do not have leave to do other than present the good news of Jesus' life, teaching, death, burial, resurrection, and ascension to the Father's right hand. We may not punch someone's ticket for hell, we may only warn of consequence. 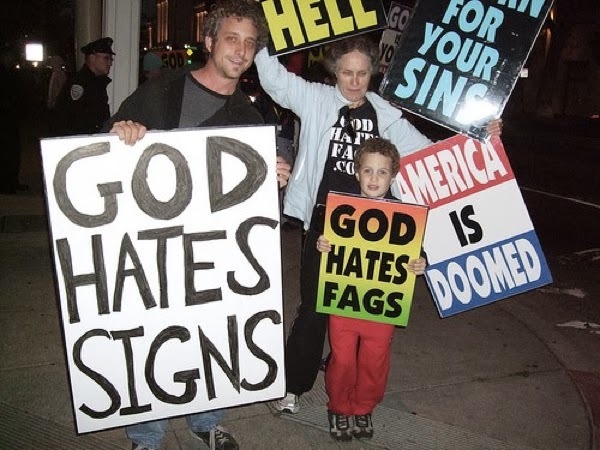 They think Christian=Westboro, and will dig and probe until they find a dull shade of brown that resembles Westboro, and then they will crucify you and your reputation, because you were stupid enough to think that they want to be your Friend, or that what they REALLY want is The Truth. Don't be stupid, or naive. Jesus said "Be wise as serpents, yet harmless as doves.". If your hobby-horse (or teir detour question) is not something that Jesus (or even Paul) would have spoken publicly of, dummy up. Shut yer gob. Talk about the issue at hand, and when they try to lead you away into Controversyville with questions about your opinion about "Y" lifestyle, or "Z" ethnic issue, or any hot-button issue apart from what your business is actually about, refuse to talk about it, as it is not germane to your issue. Do NOT be fooled into thinking it is a chance to witness, or to present some truth of the Kingdom, because it isn't. It is a chance to further inoculate the culture against the Gospel of Christ by allowing yourself to be painted as a bigot, or other such postmodern evil. * The "Dread Dormomoo" Mr. Hardy is referring too is Mrs. Hardy. They seem to be Dr. Strange fans. Original post at Aardvarks' Plumbline here. Aardvarks' Plumbline blog main page here. Don't Mess With Mother Russia! AMERICA ... IS ... FULL ... OF ... CRAP!